If you’re a North Texas resident, you’re no stranger to the effects of natural disasters such as flood damage, especially in the wake of 2017’s Hurricane Harvey and the heavy rains in 2018. Once the flooding has receded, assessing the property damage and repairing your foundation is the next logical step to getting things back on course. Homeowners who have concrete slab or pier and beam foundations may have a lot of projects to work on in the aftermath of a flood, but one integral step should be one of the first addressed: your foundation. When looking for foundation problems, it’s very important to check different areas for damage to your home, including crawl spaces and outside the main structure. What Causes Foundation Issues Due to Flooding? Whether the flood event includes long periods of standing water or rapid moving waters over a short time, flooding can do severe water damage to your foundation. Flooding penetrates deep below your foundation, causing shifts and upheavals that can compromise its strength and structural soundness. Without a doubt, the most dangerous flooding that can cause the issues for your home is the continual presence of water — the constant high-pressure barrage of water pushing against your house (or under it), which has the potential to cause foundation upheaval or shifting. Remember: Water carries a lot of weight. Another unique factor that DFW homeowners may contend with is expansive clay soil – this is a type of soil that is not generally found around other areas of the country, but is found extensively in North Texas. This type of soil expands when it comes into contact with water, thereby shifting the ground the foundation is built on and potentially causing thousands of dollars in damage. Dallas homeowners may face foundation damage from expansive clay soil due to heavy rain, so you can imagine what kind of issues you may face with flood water. What Should I Do If There Is Foundation Damage Due to Flooding? If you believe your home may have suffered foundation damage in the Dallas, Fort Worth metroplex due to recent flooding or rain, call HD Foundations immediately – we offer free foundation evaluations to determine what work needs to be done, as well as whether your home is safe to stay in. 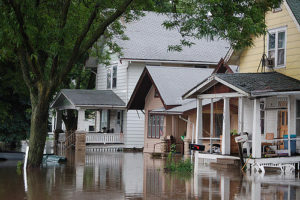 If you have been afflicted by flood waters, don’t wait – foundation issues left unrepaired will beget more issues down the line, thereby costing you more money. Keep in mind – our lifetime warranty guarantees worry-free living for years to come. Can I Prevent Future Flooding? Check the placement of your downspouts and other pipes that expel water to ensure they are not pointing towards your home. If you don’t have downspouts, invest in them now. Waterproof all entrance ways to your home to lessen the amount of water that can get through the cracks – that includes your garage door as well. Be aware of the condition of your foundation, and get preventative repairs if necessary. HD Foundations installs sturdy pressed concrete piers and steel foundation piers, which protect concrete slabs as well as pier and beam foundations from sinking, shifting or heaving. Place high-value items, including appliances and HVAC systems, off the ground. Whether you’ve recently been affected by heavy rain or flooding, or just want to prevent future foundation damage to your home, HD Foundations is a company who can help. Our affordable solutions resolve a multitude of problems. If you need assistance, contact us for a free foundation evaluation today. Does Rain Water Cause Foundation Damage?